Mary Maxam is an incredibly talented artist who lives in Idaho. She paints in oils, acrylic, and watercolour. 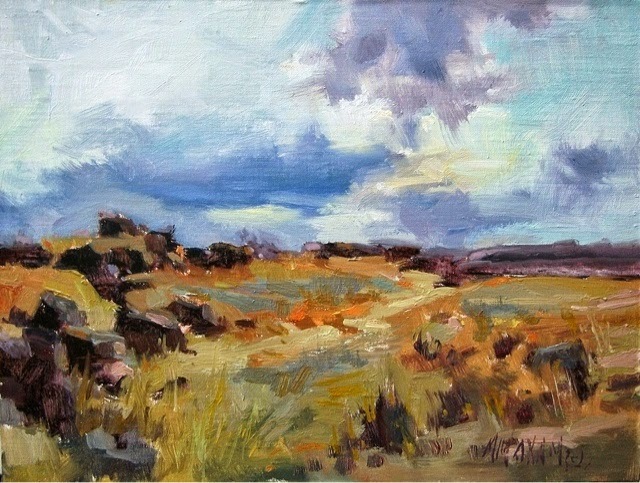 This painting is one of her most recent, from her blog. 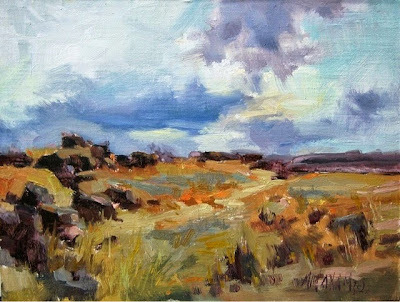 It is titled Desert Ochre, and I love the loose painterly way she has laid on the colour, and how the design draws your eye through the scene. As well as landscapes, she also paints fly fishing scenes. I am a fly fisher myself, so I appreciate her fly fishing paintings both as art and because they remind me of the sense of peace and joy that I feel out on the river. She posts to her blog, and she also has a website, Mary Maxam Fine Art. Go take look at her wonderful work. Recently I had a conversation with a colleague that turned into a bit of a heart-to-heart. She was distressed because of what she describes as a culture of bullying and backstabbing in the place where she works. "I was interviewing a candidate for a key managerial position in my institution," my colleague said. "I asked the woman what she expected in terms of our working relationship, if she were the successful candidate. The candidate said that what was most important to her was to be able to trust that I would 'get her back' and that she would do the same for me. That is, each of us could trust that the other would be supportive, and not undermining each other behind the scenes." "I felt like crying when she said that," my colleague continued. "That level of trust is such a foreign concept here where I work." My colleague works in post-secondary education in a position I would describe as upper middle management. She has been successful in her career, works long hours, and has led a number of initiatives that are making significant positive changes where she works. But, the upshot of our conversation is that she is thoroughly miserable and thinking of quitting. Not because of the work itself, but because of the culture of the place. She went on to describe a situation unfolding in her institution in which a senior colleague whom she likes and respects is gradually being marginalized and pushed out of his job. "I first noticed that my boss, who is also the boss of this man who is being picked on, would occasionally confide in me about his concerns about things that weren't going well in this male colleague's department. I realize that my boss, given his high position in the institution, doesn't have a lot of people to bounce things off of, so I suppose at first I was flattered that he was sharing his observations with me," my colleague said. "But then I noticed that he would also speak about this male colleague in disparaging ways behind his back to other senior colleagues, and even in front of support staff. Then it got worse. Other managers started to discount or belittle this man's ideas and initiatives behind his back, and sometimes to his face." She went on to describe the impact this had on her. "I felt just horrible. I could hardly look him in the eye. I felt that I should be speaking up for him, rather than letting those nasty comments go by without remark. And in fact, several times I did come to his defense in meetings, saying 'I agree with [this man's] point that blah, blah, blah,' and a few times, in private, I challenged my boss about the substance of his criticisms of this male colleague." "But then I had a little taste of being bullied myself, and so I just closed up and retreated. I go to work and I do my job and maintain a professional working relationship with other managers, but I don't try to reach out to them in a friendly way. I don't share anything personal with them because I'm just not sure who I can trust. I feel like a jerk for not sticking up for this man and others who are being picked on, and most mornings I dread the day ahead." Talking to this colleague led me to reflect on how sometimes workplaces can be healthy and safe places, and sometimes they are not. I recall that when I made my first foray into a management position, I was so surprised that the senior leaders in the organization welcomed me into their ranks and took the time to mentor and support me. Even the president, who was an extremely busy man, made opportunities to sit down with me to share information, ask my opinion, and provide pointers. He did this several times, and I was grateful. I also had a wise boss who had strong leadership skills and who mentored me. Although of course there were disagreements between people, sometimes bitter longstanding ones, as well as dysfunctional departments, on the whole I felt well supported by the leaders of the organization. What a contrast with my colleague's story! I also started thinking about a somewhat similar situation in a former workplace. I had a female colleague who prematurely chose to leave her management position to return to a more junior position. She said it was her own choice, but sometimes I have wondered if actually she was pushed out of her job too. The situation was different than that of the man discussed above, of course. This woman was in a position that was not a good fit for her, and from my perspective, clearly was struggling with the demands of the position. On the other hand, she was offered the position to address a staffing situation that was not of her making, and was provided little support and mentorship once in the job. Although I did not see bullying occurring in this situation, I wonder whether she was set up to fail. Other managers did not make much of an effort to support the initiatives she tried to lead, and she was not provided with the resources and support staff she required to accomplish the objectives of the position. Of course, it goes both ways. She also had the responsibility to behave in productive ways and to seek the information and resources that would have enabled her to achieve the objectives set out for that job. A person in a leadership position needs to have a thick skin and be adapt at building relationships and negotiating politics. A leader has to win respect and trust, and be aware that his/her performance is going to be under the microscope continually, not only by the boss, but by other senior leaders who have their own agendas and by staff that report to him/her. On the other hand, sometimes a senior manager might find himself or herself in an impossible position. A workplace culture of bullying, with its pecking order of winners and losers, can be hard to change from below. People often collude with a bully or stand by silently, in order to enhance their own power or out of fear that they will become the next victim. If the boss is the one doing the bullying, people especially are unlikely to speak out. One thing that seems clear to me is how important it is for a person in a leadership position to foster respect and a sense of trust, and to be transparent in communicating with peers or people reporting to him or her. It can set the tone for the whole organization, affect employees' mental health and happiness, and make the difference between an organization that is productive where people want to work, versus one that people are desperate to leave, and where they undermine each other and the goals of the organization. I, in my role, have the responsibility to be a supportive leader and to use my power wisely. But I still don't know what advice to give my female colleague about her situation. Are there ways for her to change the culture of her institution? Should she continue on, stoically focused on her departmental objectives and supporting her staff, and just try to steer clear of the poison politics? Or maybe she should leave her job and go elsewhere. After all, life is short. While I am praising the poetry of Francis Scudellari, I would like to post this link to another one of his fabulous poems. This one is called a day in the dream life. I love the way he explores the existential confusion at the boundaries between dreams, waking, and being in this poem. The poem itself appears below. to the unreal of my dreamy reels, but I am. This morning, surfing the net, I came across this post by Francis Scudellari, poet extraordinaire. I love the way his images of hair, snakes, tree limbs, and tongues play against each other. Also he contrasts the notion of youth and growth (nest; tender; green) with the malevolence of Medusa, expressed through the paralytic toxin of snakebites (the snakes, and their tongues "slip free"). Wonderful poem! 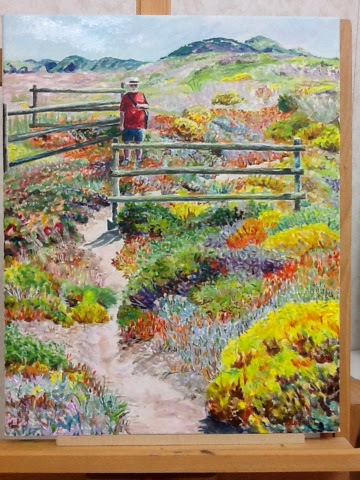 I have recently completed the painting I was working on, A Walk on the Headlands. This painting was inspired by a trip to Portugal. We spent several days at a little village on the west coast of Portugal, Vila Nova de Milfontes. One sunny July day we walked along the headlands to a small port to the north of where we were staying. It was a hot day, and the flowers were in bloom. At one place along the path, we came across some detached sections of zigzag snake fence standing alone in he middle of the field. As the fence was not continuous, we could not figure out its purpose. I snapped a picture of Rob standing by the fences. The photo above shows the completed painting. I posted about this painting previously when it was at an early stage. Rather than blocking it in, the way I usually do, I began more detailed work early in the process, then spent a lot of time trying to adjust the colours and the values. The reference photo that I was working from was predominantly in the midrange of values, which think I achieved in this painting; however, my colours are brighter. Overall, I am pleased with the final result. I have painted the scene using an impressionistic style. It reflects the feeling that I had, walking through those beautiful fields filled with flowers next to the sea. I have not usually included figures in my paintings. So this was one of the new challenges for me in this painting.